The Karen Department of Health and Welfare (KDHW), which is the health department of the Karen National Union (KNU), said health workers are still needed to provide healthcare service in KNU-controlled areas. 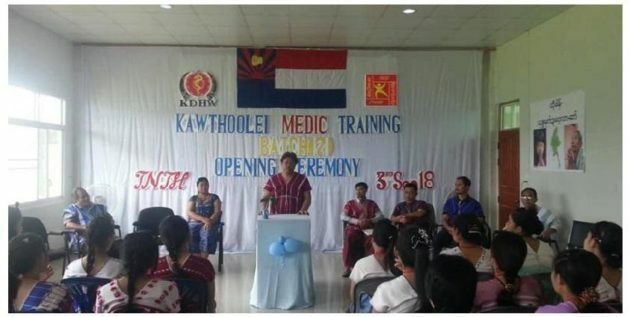 Saw Eh Pwoh, in-charge of the KDHW Central Training, said the a medic training course is being given at Taw Naw Training Hospital in Kawkareik Township, Doopalaya District since September 3 to health workers who have passed the basic health level. “A proportional number of health workers is currently still needed in the areas where we are providing our services so we are nurturing medics with this intention. The challenge we are facing is that former health workers have resigned due to various reasons. They are needed in the current situation so we still need to nurture them,” he told Karen News. Basic health workers from the seven KNU districts – Thaton, Taungoo, Nyaunglebin, Myeik-Dawei, Mu Traw (Hpapun), Doopalaya, and Hpa-an – and health workers border health organizations, which are allied organizations of the KDHW, have been invited to attend the medic training course and 39 trainees are now attending the training after passing the entrance exam, he continued. The 11-month training course will provide both theory lessons and practical training with teaching assistance from Hope 4 the World. Certificates will be issued to the medics after they have completed the training and they will be assigned to work in respective areas that are in need of healthcare, according to the KDHW. Kawthoolei Medic Training has been given since 2010 and the seven batch of training is being given now.